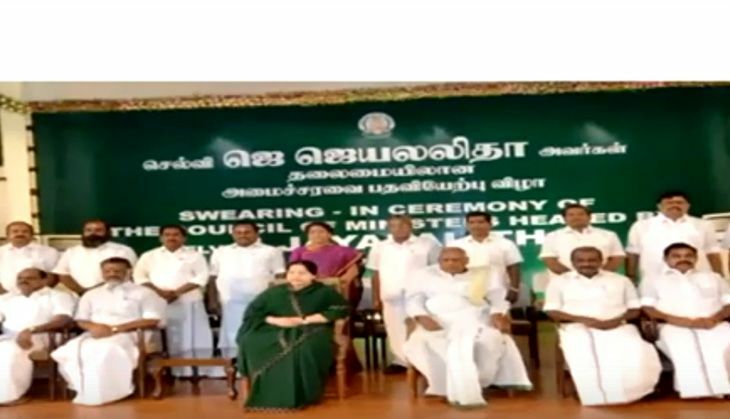 AIADMK chief J Jayalalithaa was sworn in as the Chief Minister of Tamil Nadu on 23 May in an elaborate ceremony at the Centenary Auditorium at the Madras University. This is her fourth stint and her second consecutive term as Chief Minister of Tamil Nadu. Jayalalithaa holds the distinction of being the second person in the state to hold the Chief Minister's office consecutively. Jayalalithaa took oath as Chief Minister of the state, along with twenty eight other ministers in her cabinet. The newly elected cabinet has four women, including the CM. Union Ministers Pon Radhakrishnan and Venkaiah Naidu were present at the swearing-in ceremony. Newly elected MLA, and the main opposition DMK's treasurer M.K. Stalin was also in attendance.